The Whitsunday, Isaac and Mackay Suicide Prevention Community Action Plan includes the identified needs of people with a lived experience. It also gives us clearly defined strategies and outcomes that will make a difference for individuals and families across Whitsunday, Isaac and Mackay who may be struggling. The action plan’s strategies are based on the Black Dog Institute’s LifeSpan model. These are evidence-based strategies which will provide the region with the best possible support and care in dealing with suicide. It has been co-designed by local representatives, including the Mackay Hospital and Health Service, Qld Police Service, Education Qld, headspace, Aboriginal and Torres Strait Islanders and many others. 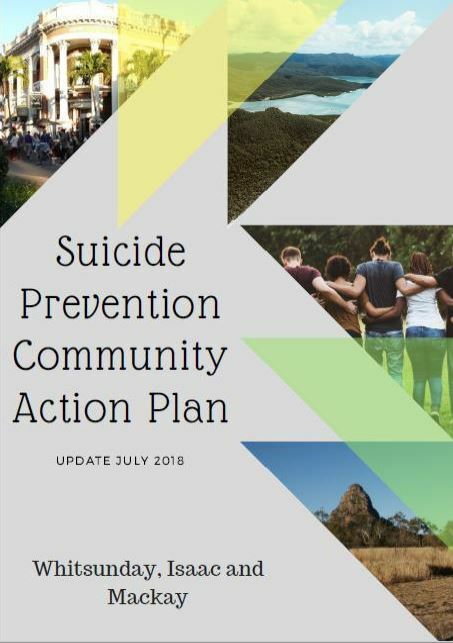 The Whitsunday, Isaac and Mackay Suicide Prevention Community Action Planning Group is responsible for the development and implementation of a suicide prevention plan for the region. The plan is based on the issues and opportunities that were identified at a Suicide Prevention Forum on 3 March in Mackay. Maintaining a consistent, long-term structure for co-ordinating evidence-based suicide prevention strategies across government, community based and other services across the region. Integrating the Zero Suicide model at Mackay Hospital and Health Service. Developing and implementing strategies that encourage wellness and resilience. Investigating the implementation of Black Dog Institute Stepped Care app by local GP practices. Knowing what suicide prevention training needs to be provided to which individual and/or groups across the region and maintaining the up-to-date knowledge and skills of identified frontline staff and gatekeepers. Other strategies to support process of ‘warm referrals’ between hospital, GPs, schools, community-based services and other stakeholders.